I love the kiss of gold on the inside of the flowers of Alabama Azalea (Rhododendron alabamense). My specimen is almost five feet tall and four feet wide, and it has been blooming for about a week and a half now. 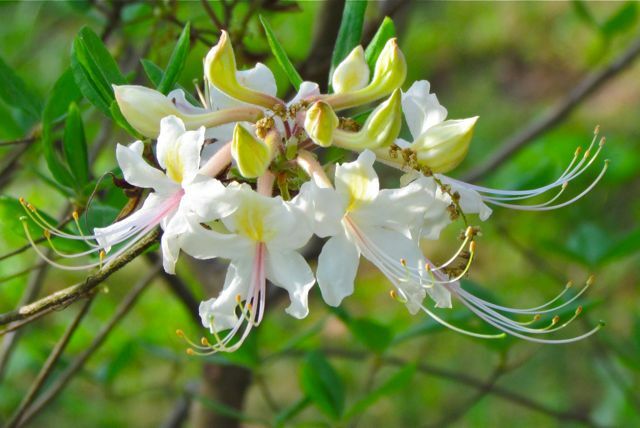 Not only do the white flowers light up a darkening woodland (as the canopy continues to leaf out), the fragrance of the flowers is intoxicating — sweetly pure, never cloying, it wafts on spring breezes to tickle the nose yards from its location. This native from the dry open woodlands and rocky hills of north central Alabama and a few spots in west central Georgia can attain ten feet in height, and I hope mine does. I sited mine near the top of my north-facing hill, where it can receive morning sun, but little hot summer afternoon heat. I keep it well mulched, but otherwise do nothing except tell it how pretty it is. I suspect the key to success with this azalea is providing excellent drainage. And here’s a hybrid that bloomed for the first time this year for me. The shrub is still small — not more than two feet high, but it is absolutely covered in eye-popping orange-yellow flowers. This is another spontaneous cross from one of my favorite purveyors of native plants. They describe it as floriferous, and I must concur. They speculate that this shrub is probably a hybrid involving R. alabamense, R. canescens, and R. flammeum, and they estimate it will grow to between 6 and ten feet high with a 4-6-foot spread. Works for me! 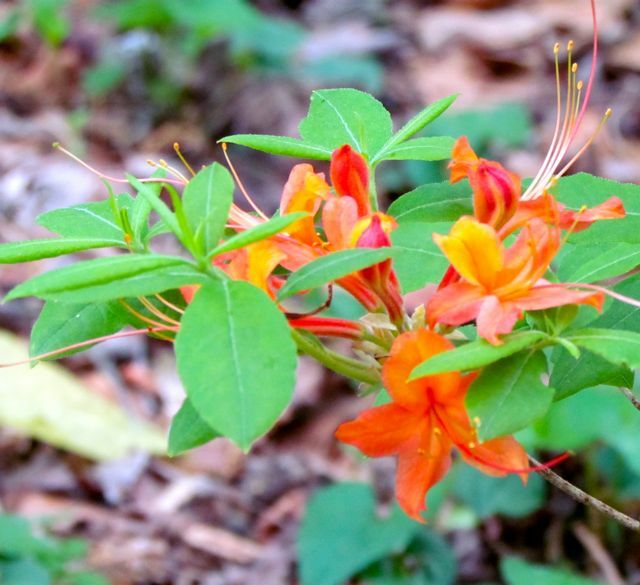 I’ll show you more native deciduous azaleas now blooming in my yard very soon. Did I mention I can’t get enough of this gorgeous group of shade-loving native shrubs? This entry was posted on April 22, 2011, 8:32 am and is filed under Favorite Plants, piedmont gardening. You can follow any responses to this entry through RSS 2.0. You can leave a response, or trackback from your own site.